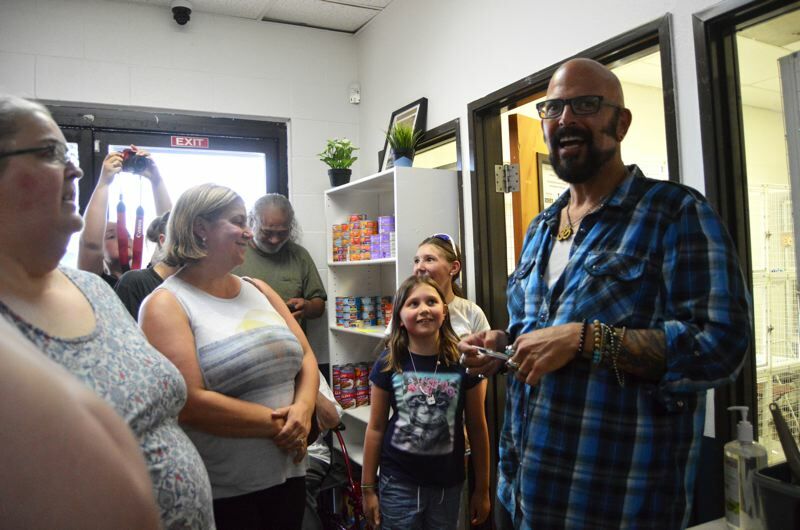 Jackson Galaxy, host of the Animal Planet series "My Cat from Hell," visited the Columbia Humane Society last week while helping deliver nearly 15 kittens to the shelter for adoption. the newly arrived, playful kittens. Mandy Manke and her daughter, Ava, asked Galaxy to sign the handle of a purple cat toy for their cat "Bob," who was a rescue from CHS. "We're huge fans of Jackson and we adopted our cat from this humane society, and (Bob) just brings us so much joy," Manke said, when asked what brought her and her daughter out. Griselda Quiroz, dressed in a pink shirt covered with the word "meow" topped with cat ears, said she came to meet Galaxy because of the work he does with animals to help keep them in loving and caring homes. She said she has seen a few episodes of the TV show and appreciates his work. "I love cats and I love what he does to save their lives by fixing their behavior," Quiroz said. "So many cats don't get a second chance." On his show, Galaxy works with families whose cats are exhibiting extreme behavioral issues. He teaches owners how to manage their pets to correct behaviors so that they're not taken to shelters unnecessarily. Galaxy noted that he was surprised by the turnout at CHS, and said it was encouraging. "Crazy, man. I was not expecting that at all. It makes me so happy, not from a celebrity standpoint, but because it's a community that rallies around their shelter, and that makes me really happy," Galaxy said. 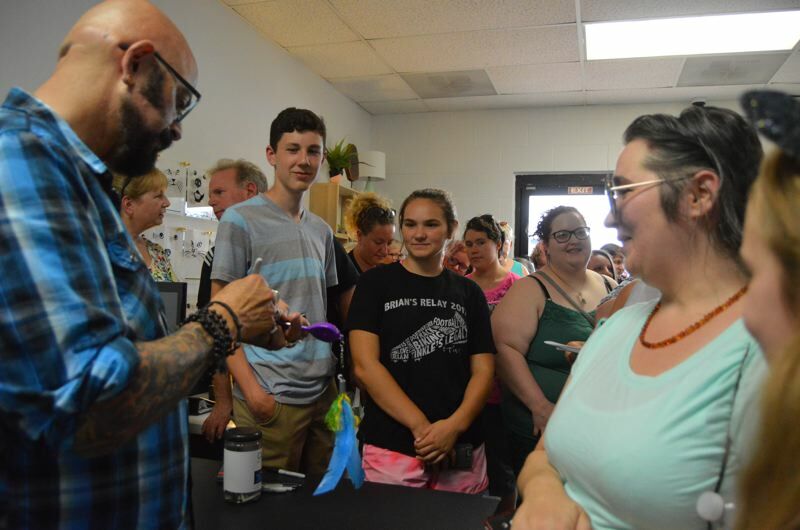 The Columbia Humane Society was recently named a grantee for the Catpawsitive Program launched and supported by the Jackson Galaxy Foundation. The idea behind the program is for staff members to work with kittens and cats in shelters to train them to behave in ways that make them more adoptable. "We go to shelters and we give them the know-how to do clicker training with cats, and to show them that clicker training helps cats be more adoptable," Galaxy said, adding that clicker training has benefits for the felines as well. "It also decreases stress and allows them to not go as kennel crazy, and it also helps get them into a routine." The benefits are also positive for cat owners. "So, if you take them home, then you have this routine you can work with, whether it's high five or a nose bump or sit — it gets that bond in place immediately," Galaxy added. "I'm not a big fan of teaching tricks just for the sake of teaching tricks ... but it helps them get adopted. If you walk by a cat and it gives you a high five, that cat is going home." As a grant recipient, staff at Columbia Humane Society will now be trained in the Catpawsitive Program and will continue to work with the animals in their care. "I think it just gives a spotlight to what we're doing here," CHS director Lisa Beggio said. "We are trying to do positive things in the community."